The way you structure your code is a key factor when you define your source code organization. It will make your life easier or miserable, and once this structure is established it will become a really tedious task to redefine it. That’s why you know about the different patterns available and choose the one fits your project best. And this is exactly all we are going to need to create blocks of encapsulated code, hidden one from another. 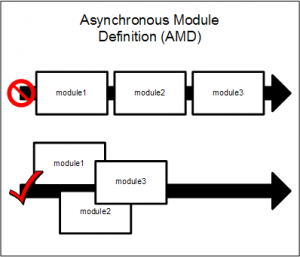 But modules as we know them today are a little bit more: modules are ways of defining chunks of code that are dynamically loaded. AMD & CommonJS have a wide support, but in my opinion, each of them have a slightly different approach: AMD seems to fit better in browser-side (it’s inherently asynchronous) and CommonJS seems to fit better in server-side, where synchronously loading code is a choice. Of course, you can use third libraries to use them in whatever environment, but it doesn’t seem the natural way. There are some hybrid approaches, so you don’t have to pick any them, but both, but this only makes things harder and difficult to follow. Luckily, ES6 modules are (or will be) part of our day-to-day, so I strongly suggest this should be the way to go. Currently, browser support for ES6 modules is only achieved via transpilers or libraries, so we’ll have to wait a little bit longer to use this feature. V8 implementation is still incomplete, so no luck neither in server-side. Until then, you’ll still have to choose a pattern to go with. I recommend you not to enter this holy war, but just to pick one of them and keep coding great stuff.